Jubal played a bunch of hippy-dippy crap that quite a few folks liked to listen to at the time. Little did they know that one day this "homo-rock" band, as one rather uncultured country music fan once called them to their face, would eventually transform into a club-rock power house. 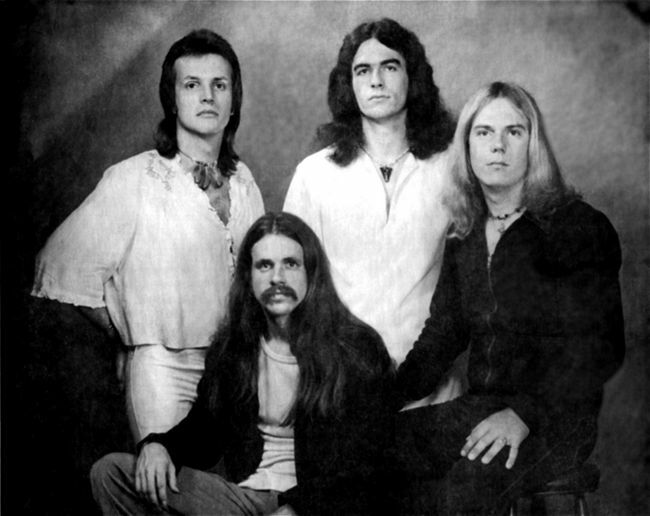 Original members (pictured here) were Steve, Randy, Kelly, and Allen Jones. After a while, Allen got tired of the endless travel and decided to get a real job. He went back to school to finish his studies as a veterinarian. Allen was one of the areas most dynamic guitarist. The band figured replacing him could be difficultand it would have been if the band hadn't been very lucky. It had been only a few short months since the band brought in Bob (saucer head) Sanger on keyboards, but this was a lucky strike. Bob's friend Ben (Artie Choke) Mullen seemed perfect for the direction the band was heading musicallymeaning the band could pull off even more of that hippy crap. Well, Jubal was actually a very good band playing some very difficult music: Lots of Yes and Genesis, with a pretty big helping of Queen, Led Zep, Robin Trower, and Aerosmith. They were known as a band with some of the best vocals of any band in the area. And there were some great vocal bands around at that time. They'd have to have great vocals to pull of the stuff they did. and one of them was Jubal.